Note that the development versions are not compatible with the stable 2.0.x release branch which is available from Sourceforge. This update replaces the 2.1.0 devel release, and the devel update site is only compatible with the 2.1.1 release. 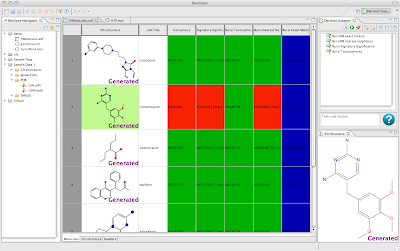 Figure: Screenshot teaser from the Bioclipse 2.1.1 devel release showing the Decision Support feature in action for a collection of molecules. I recently created a Bioclipse feature to filter chemical structures in a StructureDB database (the new database for chemical structures in Bioclipse). 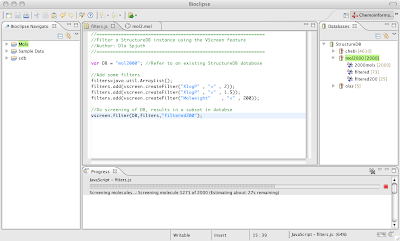 The new plugin is called VScreen, and aims at being a future Virtual Screening feature. Currently the feature is in very early proof-of-concept state with only two simple filters, Molecular Weight and XlogP. Plans include to create an extension point for filters that plugin can extend to contribute new filters.